This simple, hearty, and vegan soup comes together in about 30 minutes. Perfect for a weeknight winter dinner! I had a different recipe planned for today, but it was going to involve some work this weekend … and an evil little stomach bug had different plans for me. But you don’t want to know anything more about that. I was actually going to save this Thai Green Curry Lentil Soup for March. Even though it’s not really all that green, with its green lentils and green curry, I thought it would still be perfect for the holiday that’s all about green – St. Patrick’s Day. But I’ve been eager to share it with you for awhile now, so this ended up being a great excuse. This is one of those recipes that came together based on what I happened to have in my cupboards, and it quickly became a favorite. This simple little soup is perfect for a cold winter’s day. It goes from pantry to table in just about 30 minutes, it’s relatively healthy, and with its lentils and coconut milk, you can check “creamy” and “hearty” off the list, too. It’s got a good hefty dose of Thai green curry paste, which is milder/less spicy than its red curry cousin. But it still adds wonderful complex flavor and just the right teeny-tiny touch of heat to the mix. 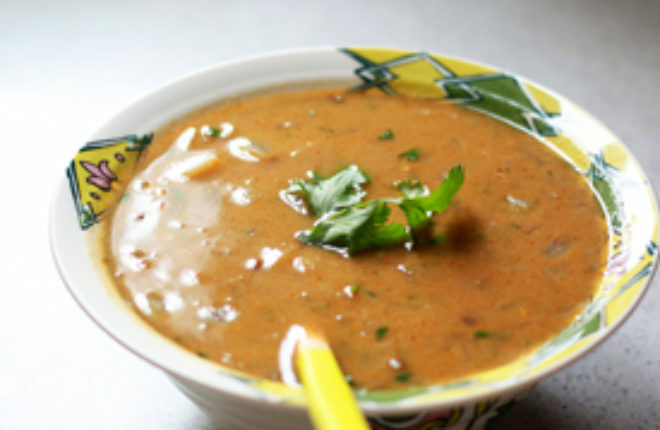 I like this soup with French green lentils, which hold their shape after cooking. But it would also be great with regular green lentils – just a little less structure and thicker. All good, though! This soup freezes and reheats nicely, too. I like to make half for a quick lunch, then freeze the rest for an easy weeknight dinner down the road. Oh, and it’s vegan, too! Have I sung its praises enough yet? I guess you could say I’m glad I shared it now. Although I would have rather shared it without having to get sick, but … you know. It all worked out. Heat the olive oil in a medium saucepan over medium heat. Add the onion and cook until translucent and beginning to brown, 7 – 8 minutes. Add the garlic and cook, stirring, for another minute. Add the vegetable broth, lentils, curry paste, ginger, coriander, and salt. Increase heat to medium-high and cook, stirring, until the soup comes to a boil. Reduce heat to medium-low and cover. 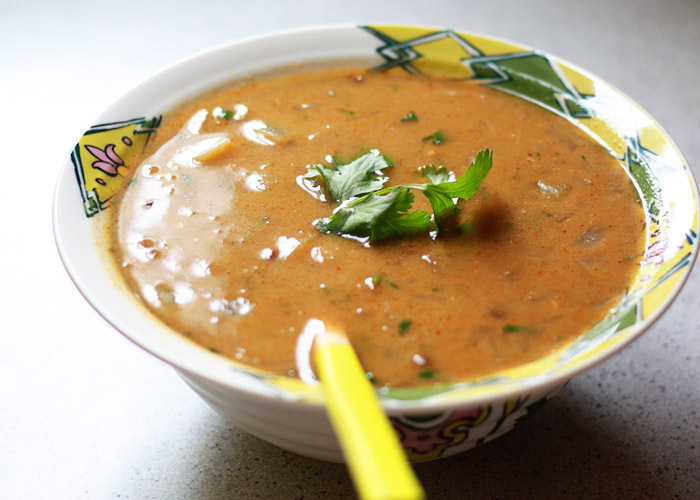 Simmer for 25 – 30 minutes, until lentils are tender. Add coconut milk and return to a simmer, stirring frequently. Stir in cilantro. Serve. * I use Thai Kitchen brand, which is vegan (no fish products). Some curry pastes might contain fish or shrimp so be sure to check the ingredients! 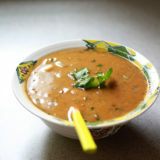 It’s been so miserably cold in London, this soup looks exactly what I need to warm me up!! That second picture with the steam is gorgeous, yum! Thanks, Courtney! I’m feeling better but still crummy. Tried to dice an onion yesterday and had to leave the kitchen! Hopefully life will return to normal for everyone around here soon. 😉 At least it’s temporary, right?! I’m pinning this, can’t wait to make it! Thanks for the recipe! Ack! That’s what I get for posting while sick. Rinsing and sorting curry paste would be a tad challenging – lol. Fixed. 🙂 Thanks, Sarah! this might be a dumb question, but are green lentils the same as green split peas? i’m assuming not but can’t find french green lentils at the grocery store. could i use regular lentils? Unfortunately, green split peas and French green lentils are not the same, although they do look similar! 🙂 Regular green lentils or brown lentils will work fine instead; they just won’t hold up quite as well. But it should still taste great! Great to know – thanks! So I went to Whole Foods and found the french green lentils….so here’s my next silly question, you say to rinse and sort them….I get the rinsing part, but sorting? Thanks! Can’t wait to make this tonight! We’ve made this twice now. Tonight we added carrots and cauliflower right after the onions and it was excellent. We also added more lentils just to use up what we had, so it was thicker. I love that this is a forgiving and tailorable recipe. Thanks for posting! So delicious! Made this for dinner last night – it was absolutely delicious! 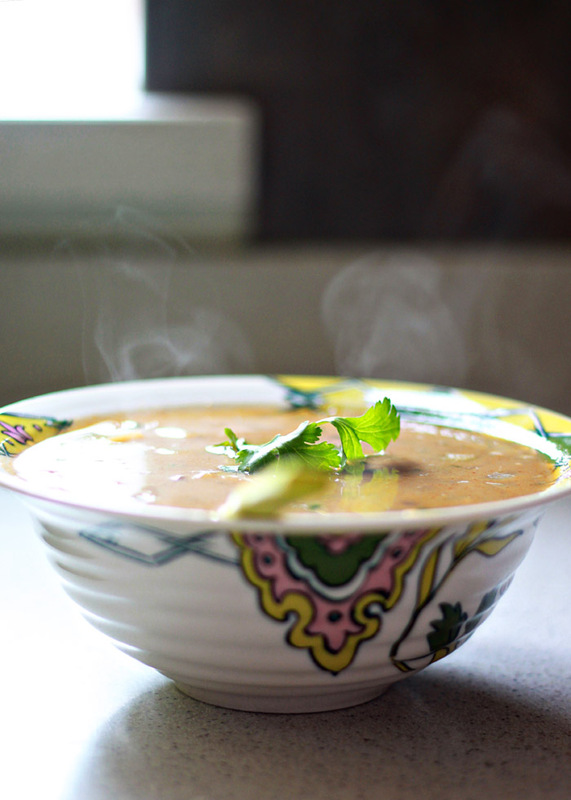 I love lentil soups, and I love Thai flavors, so it was a win-win! I love how fast and easy it was, too – great recipe! I wanted it to be green! But I think a combo of the lighting + my use of a boxed veg broth that was on the orange side made it look more reddish than green. Still delicious though! Tried this out yesterday with a few tweaks – substituted mung beans for the lentils as that’s what I had on hand and added some carrot and spinach to up the veggie content, and used a slow cooker instead – threw everything less coconut milk in on low for 8 hours and then added the coconut at the end and enjoyed it with some rice noodles today for lunch. Thanks for a tasty simple recipe! Yummy! I added a little thai chili pepper because I like spicy food, a little carrot and kale to add veggies, and because I did not have ground coriander on hand I substituted with fennel and coriander seeds (after grounding with a mortar and pestle) . Thank you for a simple recipe! Do most thai curry pastes contain shrimp? Hi, I believe some do. But I use Thai Kitchen brand which is vegan. Made the green curry lentil soup it was very good. Everybody loved it simple ingredients only took one pot. Not too spicy. I definitely will be making this soup again. Could red curry paste be used? Sure, give it a go!